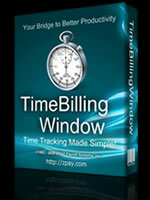 Time Billing Software - TimeBillingWindow Tracks Your Time And Create Invoices For Billing Your Clients. Are you a Lawyer, Consultant, Web designer, or anyone that has clients where you need to track the time and bill them for work you perform for them? If so, then TimeBillingWindow is the tool for you! No more managing hours by hand! No more spending half a day trying to add up the billed hours and pulling your hair out because you lost the notes that you kept your time on or cannot read them! Automation with our time Billing software is the answer! Tracking time is as easy as passing your mouse over a Tray Icon and clicking to start and stop the timer. You can store as many clients and jobs as you need in this Time Billing and Time Tracking software and it's always just a click away! The best thing about TimeBillingWindow is that it is always ready sitting in as a tray icon in the bottom corner of your screen. That means you are only a mouse movement away from logging your time as you work with clients on the phone or in the office! 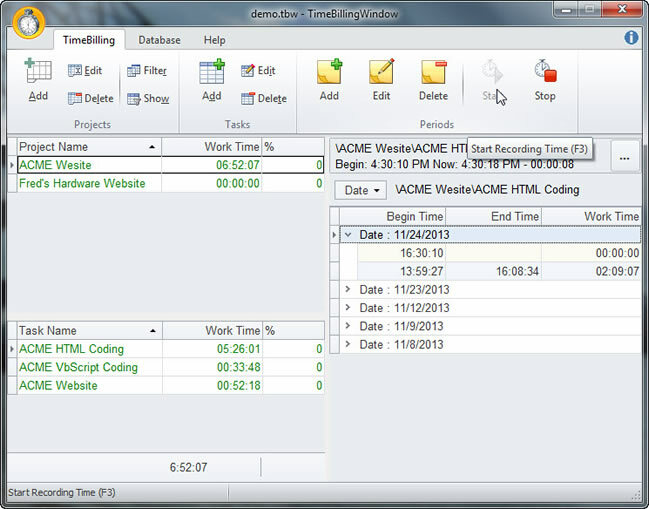 Starting with the time billing interface, as you can see below, it shows you exactly which tasks are open and being timed while collecting the time worked for fast and easy billing. It's so easy to use that you don't need to be a computer expert to set up and start using this time Billing software immediately. In fact it's so easy that we sell through the Try-Before-You-Buy method of marketing known as Shareware and we want you to download and see for yourself before you buy it. Use the download link on the top menu to go to our download page. Watch Videos on how easy it is to use! Click here to open the video tutorials page. The above interface of TimeBillingWindow gives you all the tools and power you need to set up and manage your client time billing records. If you charge by the hour the work that you do for your clients, this is the tool for you, simple, fast and very easy to use. The small Tray Icon site waiting for you on your desktop. A client calls, you pass your mouse over the tray icon and our quick pick window springs into action. 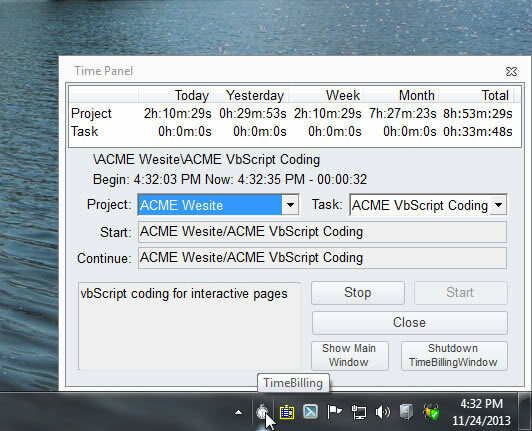 You can log your time in that window as you see below or select to open the main window to log your time. Below is the Edit Time Periods tool from the administrative tools. As you can see, you have the ability to edit, delete and add new time records in this tool. This is just one of the many powerful features to save you time in managing the recording of time that you work for your clients. Don't stop here, use the Download selection on the top menu of this page and download and try TimeBillingWindow for yourself today. It's a FREE download and you can use it for 30 days to try it out. If you like it, come back and pay for it and we will send you an unlock code to keep it working after the first 30 days. 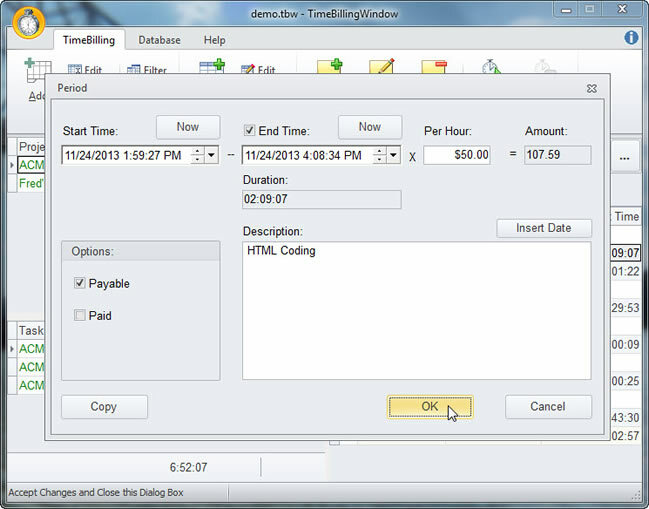 To make it easy in setting up TimeBillingWindow, watch the video tutorials we have on-line. Click here for that page. If you are looking for a great payroll software package, visit our main website at http://zpay.com and check out PayWindow. 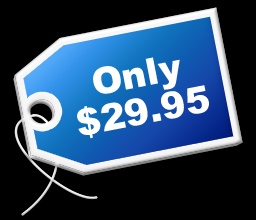 This is a full featured affordabe payroll software package that you can try for 30 days for free.